The United States retained the Solheim Cup with a 16½-11½ victory over Europe at Des Moines in Iowa. The hosts went into Sunday's singles matches with a commanding 10½-5½ lead and kept their nerve to hold off Europe's attempted fightback. Cristie Kerr and Paula Creamer both won their matches before Angel Yin secured a half point that put Juli Inkster's team on the brink of triumph. Lizette Salas clinched victory with a one up win over Jodi Ewart Shadoff. "To secure the point that wins us the Solheim Cup is unbelievable," said Salas. "My hands were shaking. This is really special." The United States have now won five of the last seven competitions and 10 from 15 since the Solheim Cup began in 1990. "The Europeans fought hard today and made it really close," said US captain Juli Inkster who joined Judy Rankin as the only women to captain back-to-back winning US Solheim Cup teams. "I really haven't been nervous all week but today I was a little bit. It's an honour to captain this team and I'm really proud of the girls." "We just got outplayed, there's no doubt about it," said European captain Annika Sorenstam. 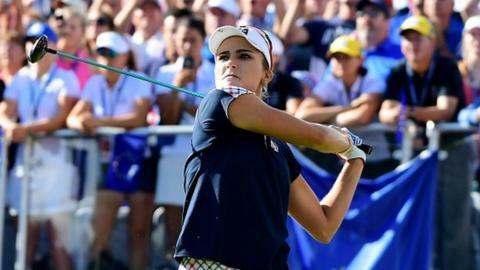 In the first and best match of the day, world number two Lexi Thompson was four down to Europe's leading player Anna Nordqvist after nine holes. The American rallied superbly with eagles on the 11th and 15th and birdied the 16th to take a one up lead heading into the last. But Nordqvist, who had won all three of her matches over the first two days despite still recovering from a bout of glandular fever, hit an inspired approach shot on the last to halve the match. "That had to be the weirdest round of golf I've ever played," 22-year-old Thompson said. "Front nine I don't think I was awake and back nine I played lights out. It was just a crazy round but Anna played great." Nordqvist added: "I got a little shaky there in the middle watching her make birdies and eagles but she gave me the chance missing that putt on 17," said the Swede. "I'm very impressed with her back nine and very proud of myself." Thompson's comeback gave the American team momentum and Kerr wrapped up a 2&1 victory over Mel Reid on the 17th and moments later Creamer won one up against Georgia Hall. That left the hosts needing one more point to triumph but victories from Germany's Caroline Masson, who beat Michelle Wie 3&2, and veteran Scot Catriona Matthew, who trailed all the way until the 15th before beating Stacy Lewis one up, made the scoreboard look more respectable. Angel Yin looked like she would complete the hosts' victory but the 18-year-old bogeyed the 17th and halved her match with France's Karine Icher, but with the US ahead in other matches it was enough to confirm they would retain the cup. Spain's Carlota Ciganda thrashed Brittany Lincicome 4&3 before Salas held off England's Ewart Shadoff for a one up victory on the 18th. England's Florentyna Parker lost 4&2 to Gerina Piller but Charley Hull, who missed all of Saturday's play because of a wrist injury, battled to a one up victory over Brittany Lang, and Sweden's Madelene Sagstrom earned a 3&2 win over Austin Ernst. The competition finished with Emily Kristine Pedersen losing 3&1 to Danielle Kang but the European team showed their team spirit by walking arm in arm down the 16th fairway with the Dane. Sorenstram confirmed afterwards she would not return as Europe's captain for the 2019 tournament at Gleneagles. "I said this was a one-time thing for me," she said. "It is time to move the torch to the next person." Europe simply had too much to do. The decisive session came on Friday afternoon when the visitors were whitewashed in the fourballs and in the singles Europe produced a spirited display. The half between Anna Nordqvist and Lexi Thompson will be remembered as one of the greatest Solheim singles matches. Catriona Matthew completed a remarkable match, gaining three points out of four. The Scot should have been named in the team rather than as a late replacement for the injured Suzann Pettersen. The Norwegian's absence was crucial, as was Charley Hull's departure from the fray throughout Saturday to rest her injured wrist as Europe do not possess the strength in depth to cope with the loss of such talents.